In this guide you can find information on how to implement preset positions and how to move the camera to these positions. 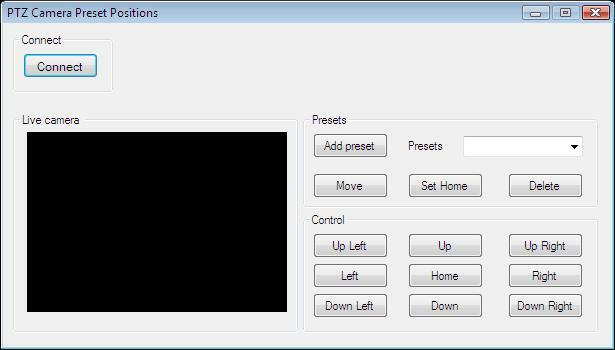 With this feature your application will be able to compose a limited set of preset positions and navigate between them during the usage of your IP camera. To implement this example, you need to have OZEKI Camera SDK installed, and a reference to OzekiSDK.dll should be added to your Visual Studio project. Then the first example of this chapter gave an introduction to the control features of the camera application. The 2nd example presented how to implement automatic scan operations between fixed points. This section is about the data structure of the preset positions. With this code snippet in your application you can build a collection that contains all preset positions of the camera's scannable image. The maximum size of the repository depends on the type of your camera device that you are using your application with. Your applicaton must be able to handle the preset positions. On the picture below you can see the necessary GUI elements that work as the required functions. This funcionality is based on 4 important WPF Application components: a ComboBox that makes the user able to choose from the preset positions. A "Move" Button that controls the camera to the required position. Finally, with the "Add" and "Delete" buttons you can add new and remove existing positions from your collection.